Tag line: "She has a life of her own. Now she wants yours"
When it comes to killer dolls, flicks like Child’s Play and Puppet Master (along with their plethora of sequels) get the bulk of the attention. But there are others worth noting as well, including Magic (a 1978 movie starring Anthony Hopkins and a ventriloquist dummy), Demonic Toys (like Puppet Master, a Charles Wade / Full Moon Production), Stuart Gordon’s 1987 film Dolls, and James Wan’s 2007 scare-fest, Dead Silence (a picture I have serious issues with, but which is pretty damn creepy nonetheless). 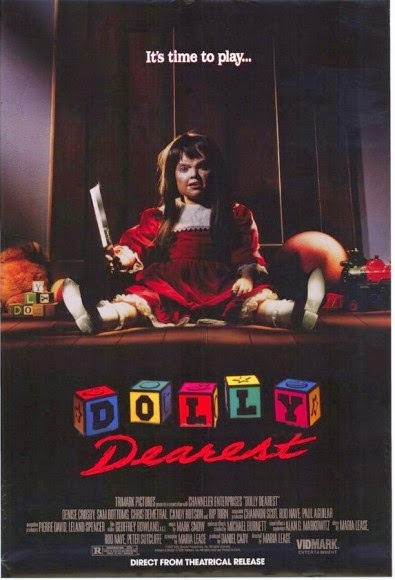 Dolly Dearest, a 1991 offering directed by Maria Lease, is a lesser-known entry in the horrific dolls sub-genre, a movie that, while it certainly has some problems, is entertaining enough to be mentioned alongside the ones listed above. When American Elliot Wade (Sam Bottoms) becomes the new owner of a Mexican-based doll factory, he packs up his family: wife Marilyn (Denise Crosby), son Jimmy (Chris Dematral), and daughter Jessica (Candace Hutson), and heads south of the border, where he hopes to make a fortune mass-producing the “Dolly Dearest” toy line. Things take an unexpected turn, however, when archaeologist Karl Resnick (Rip Torn), who’s spent weeks investigating a nearby cave system, accidentally wakes an evil spirit, which flies to the Dolly Dearest factory and possesses one of the many dolls sitting on a shelf. After spotting this doll and claiming it as her own, Jessica falls under its spell, putting the young girl, as well as her entire family, in the greatest of danger. As I said, Dolly Dearest has its share of problems; along with the pacing, which at times is painfully slow, I found it difficult to accept Rip Torn as a Mexican archaeologist (he’s an actor I admire, but wasn’t the perfect fit for this role). That said, the film does feature a number of effective jump scares (one in particular, set in a basement, really got me), and Candace Hutson gives a decent performance as the daughter who gets a little too cozy with a possessed doll. She’s especially good in the scene where a priest, who was contacted by the family’s maid Camilla (Lupe Ontiveros), shows up to bless the house. Without divulging too much, I can tell you Jessica doesn’t exactly welcome this priest with open arms! Along with the issues I already touched on, Dolly Dearest also ends miserably, a climactic sequence so preposterous that it had me rolling my eyes. Yet even this didn’t kill the movie for me. Sure, Dolly Dearest will never be regarded as a classic (not even in the somewhat sparse killer doll sub-genre), but it does have its moments.